Size: 18 x 170mm/0.7" x 6.7"
Whenever you are a leathercraft professional or just making some unique leather items like belts, bag, straps, dog collars, wrist straps, etc., you are to have a set of handy and functional leatherworking tools. 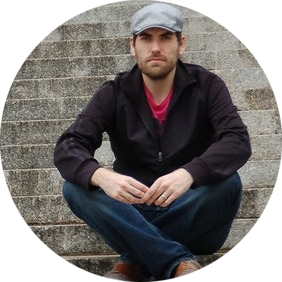 A good, user-friendly edge beveler is among them. A beveler for leather is a tool that helps you to trim and round off the belt or strap edges, making them neat and complete. Therefore, it is to be sharp and durable, made of top-quality steel. The best items are comfortable to grip, featuring well-shaped, wooden handles, being suitable for long, unfatiguing work. Additionally, skiving and channeling abilities are desirable, especially for thick rawhide materials that are to be smoothened before sewing. So, let me review several top edge bevelers that are preferred by professionals and experienced craftsmen. 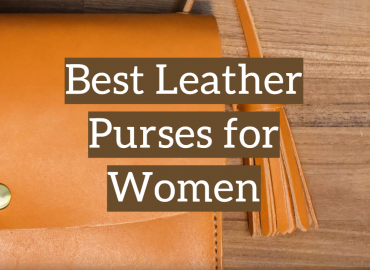 I would also give you some piece of good advice on which size and blade width to select for thin goatskin and thick leather, which brand is the most reliable. How to Use a Beveler? How to Sharpen an Edge Beveler? Going to craft your unique cowhide items during the nearest several years, at least, select this durable, top-quality edge beveler. The item is comfortable, high-end and looking great. It is made of the premium materials: the blade is steel, sharp and efficient; the handle is wooden. Therefore, the hand grip is comfortable, suitable for hours of work without great efforts. The 0.08” (2 mm) groove width is large, suitable even for the thickest rawhide items edge cutting. Skiving with this handy tool is also enabled: you can make both oblique cut and flat shovel edges with it quite efficiently. Additionally, a protective case is available, making the gear easy to store and safe. The dark brown case color is pleasant, elegant and hard-wearing, optimized for long-lasting use. easy to store; only one size available. The product is very similar to the previously reviewed item. If we compare the design and performance, they are analogous; the handle and blade lengths are the same. Skiving, flat shovel and oblique cut trimming are enabled. However, the tools are evidently made in China, distributed by the fashion company that started international selling operations since 2017 and expanded its range significantly. Meanwhile, the beveler is top-quality, made of hardwood and steel, featuring a comfortable handle. 6 sizes (groove widths) are available: 0.8; 1.0; 1.2; 1.5; 1.8 and 2.0 mm. Therefore, the bevelers’ selection is wider and you can choose the item according to its application and the homemade leather item thickness. Additionally, the products are affordable, safe to store and easy to use. a protective case is available; not the most durable. If you often deal with rawhide and goatskin materials of various thickness and density, a perfect kit from ABYSTEPS Company is a great option. You can select a set of 3 different groove widths (No1-3), suitable for processing 2-8 oz. heather items. The one size sets designed for the definite material thicknesses, are also available. Actually, the kit comes from the famous Wuta Leather brand. 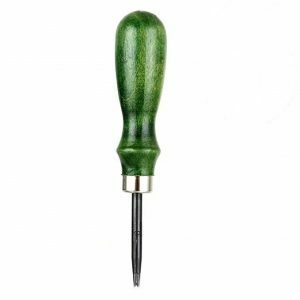 This company produces a wide range of top-quality leatherworking tools and materials, as well as accessories for belts and bags, templates, needles and threads. Thus, the Wuta-branded kit of edge bevelers stands out by the impressive durability and efficiency. The blades are made of the hard and strong carbon steel. They are sharp and smooth, with groves on both sides for easier trimming and skiving, that help to create the accurate angle on edges. Therefore, it works on shoemaking projects and activities. The handle is user-friendly, made of solid wood, comfortable to grip. 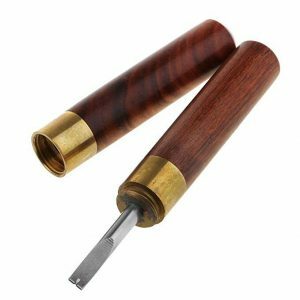 Thus, the edge beveler set is highly recommended for various leather items crafting and repair. I only don’t like that protective cases aren’t available, but only the small, transparent, plastic caps that are flimsy and easy-to-lose. specially designed handle for comfortable grip; a bit expensive. 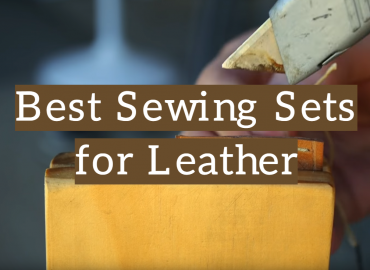 Crafting, renovating and sewing unparalleled leather items, prefer the versatile tool with 7 various tips. Three of them are designed for trimming, one for creasing. A hex wrench, an L-shaped groover, an edge beveler are beneficially included. Therefore, using all of these perfect accessories, you can prepare the item rims for stitching comprehensively and efficiently, skiving or cutting the edges. The wooden handle is large, curved and well-designed, comfortable to grip. The groove width is adjustable, depending on its application and your requirements. The product is made in India, of high-quality stainless steel. 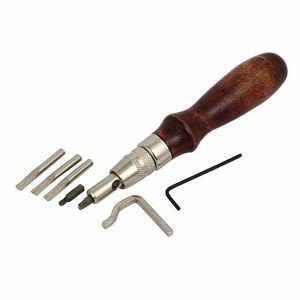 Thus, the Tradico-branded, multi-purpose grooving & trimming set is highly recommended for everyday use, experienced craftsmen and DIY projects. convenient handle; it takes some time to change the tips. Processing, restoring or sewing the common, 2-8 oz. sheepskin materials, you may need 3 different bevelers for each leather thickness and quality. The set includes 3 various-sized tools. Their width is 0.8-1.2 mm. 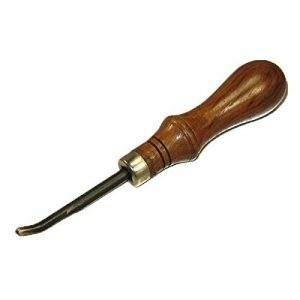 Additionally, a wooden burnisher is available, that helps you to polish and slick the belt’s or strap’s edges. The wooden handles are perfect, comfortable, easy to hold. However, I would be skeptical about the steel alloy composition. I guess it’s less strong than stainless or carbon one. The tips themselves seem to be hard, but the metal of ferrule looks really thin and lightweight. 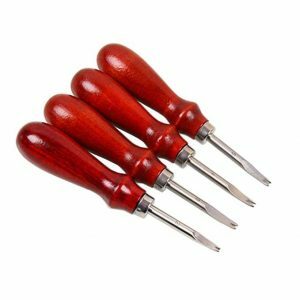 Thus, the set is top-quality and lightweight, perfect for casually-employed leather crafters and DIY enthusiasts. Additionally, I recommend it for homeowners and farmers that deal with belts, dog collars, horse saddles repair from time to time. handy grip; a slight size tolerance is allowable. Chamfering the unique, professional-quality item’s rims, rounding the edges, you might require any of 5 sizes, suitable for 0.5-6.0 mm. sheepskin thickness. They are designed for making smooth round corners and channels for easy stitching the pieces. Comparing the tool with similar products, it stands out by the highest quality and significant weight. The handle is really weighty, featuring the brass ferrule. It’s made of the elegant, black, ebony wood, looking stylish, being hard-wearing. The blade, made of the stainless steel, is sharp and long-lasting, suitable for repeated use. It’s made in China, by the well-known Owden Tools Factory. 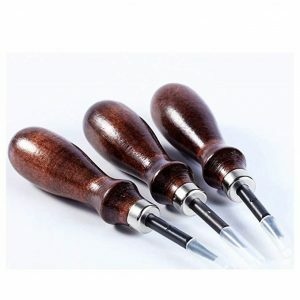 It was founded in 1998, producing a wide range of craft and leatherworking tools. Generally, I would recommend the edge bevelers for tradition-bound professionals and craftsmen that aim at perfection. The gear is worth the comparatively high price, specified for one item of each size, being user-friendly and perfect-to-use. perfect sharpness; the tools are sold separately. What a wonderful color! Nature lovers would definitely adore this rich, emerald green finish! The handle is well-shaped and comfortable. However, the blade is very efficient, curved, made of the top-quality steel. 5 different sizes are available to choose from, with the bevel width from 0.6 to 1.4 mm. They are suitable to process 0.4 – 4.5 mm.-thick leather. As usual, only one tool is included in the package, but together with a piece of sandpaper and a grinding rod. Therefore, the goatskin processing sets are very handy, user-friendly and easy-to-maintain, as the materials, necessary to sharpen the blades are enclosed. the sandpaper and rod are included in the set; a bit too weighty. The bevelers are available in 5 different sizes, with 0.6 – 1.4 mm wide notches. For example, the size 1 is designed for processing the most delicate goatskin, 1.5-3 oz – thick. The bevelers are suitable for trimming and rounding off the belts and bag strips edges. They can be also used for lining out zipper slots, removing excess welts, etc. 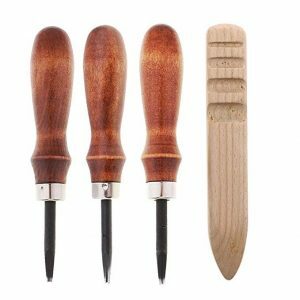 They are top-quality, coming with natural, perfectly polished wooden handles, metal ferrules and sharp, steel blades. The products are distributed by the well-reputed Zelikovitz Leather Company. It was established in 1890 in Canada, supplying a wide range of ready belts, leatherworking tools, stamps, sewing machines, cowhide and sheepskin materials. You can order everything you need for your leathercraft activity, including these highly-recommended bevelers, from the supplier. Meanwhile, as the item number is corresponding, I think, there are the famous Tandy bevelers. versatile use; requires sharpening before use. Having an affordable edge beveler for DIY projects or professional leather crafting is quite beneficial. If you would like to compare, this item is similar to the set by Baver. The same wonderful emerald green handle, the same 5 sizes (cutter widths). The steel alloy seems to be the same, as well. However, the beveler is supplied alone in the package, without any accessories or materials. 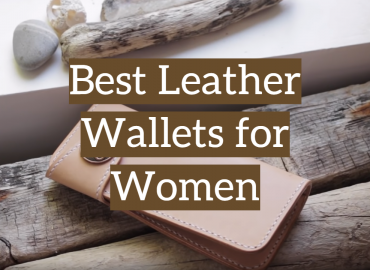 Therefore, it’s not expensive, and it can be presented as a gift for amateur artists that deal with various goatskin materials from time to time. sharp blades; just a common steel alloy. At first sight, the set stands out by bright, red wooden handles. They are well-shaped for convenient grip. The steel blades are polished, sleek. I would say, it’s definitely not the carbon steel alloy, but perhaps a food-grade one, like 304 or 18/8 (with nickel and chromium). 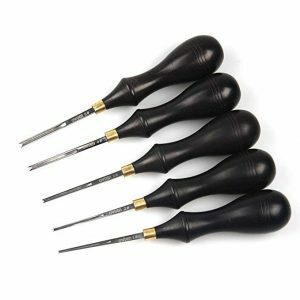 The set consists of 4 tools with 1.0-2.0 mm wide bevels. They are suitable for processing (skiving, slicking, beveling) of different vegetable-tanned rawhide materials that are rather thick (of 1.5-5 mm. thickness). 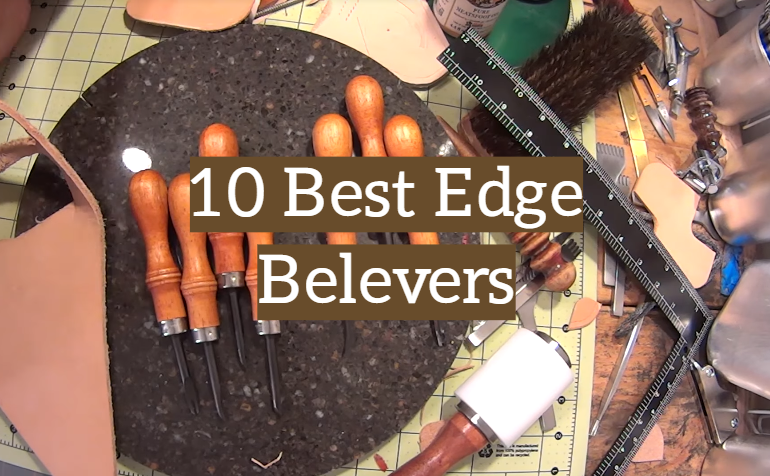 As to the bevelers’ lengths, 5.5-inch, it’s quite standard for the leatherworking. 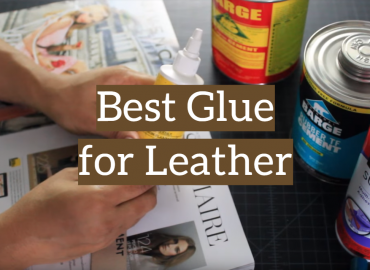 The set is quite efficient and it’s recommended for leather repair professionals that deal with various sheepskin items every day. 4 tools in a set; not the strongest possible blade steel. the handle and the blade shapes and materials. As to the handle colors, it’s a matter of taste. Meanwhile, bright ones are well-visible, not easy to lose. Dark, brown and black ones are hard-wearing and professionally-oriented. size 4 – 8-10 oz. Commonly, the number on the tool is about the half the leather weight. For example, size 3 works the best on the 6-oz sheepskin, size 5 is well-suited for 10-oz rawhide material. Additional tools like burnishers and groovers are useful for the trim channeling and smoothing. 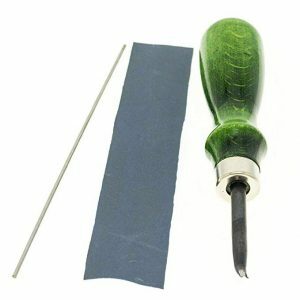 Accessories like sandpaper and grinding rods are helpful both for DIY and professional projects. Keen tools are concaved (dished) and arched, with a small radius on the end. They allow going over several times against the same spot, making deeper and deeper grooves. It suits perfectly for processing external round corners smoothly. A regular edge beveler is straight, with an angle on the end, and a convex side. It works better on the inside corners. Additionally, these tools are recommended for beginners, as they cut pretty easy. 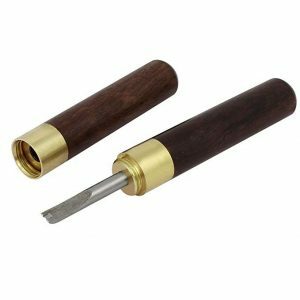 apply a droplet of burnishing agent and polish the end with a wooden burnisher. All tools, even the best ones, require sharpening from time to time. You can use a leather strop, grinding rods or leather lace and small pieces of sandpaper to the effect. As a leathercraft professional, I would advise you to take a stick of wood and glue several, different-diameter laces (for the keen edge bevelers sharpening), and a piece of grit paper (for the regular ones) on its one side, the strop on the second size. The split leather surface and the laces can be treated with white jewelers Rouge. I think, the best edge beveler for leather is the item by Zelikovits. It comes from the famous Tandy brand, widely discussed by leathercraft professionals online. The most complete set in terms of tools’ sizes is the product by Portal Cool. The best accessories are available in the sets from Baosity and Baver.